It is really rare for me to go out these days... It is even rarer (does this word even exist?) for me to put on make-up. I am usually so swarmed with work that the furthest that I'll ever go is to the nearest mall from my place and that's it. I went to SGH to visit my aunt who is warded there. Had Burger King's for lunch before I went. 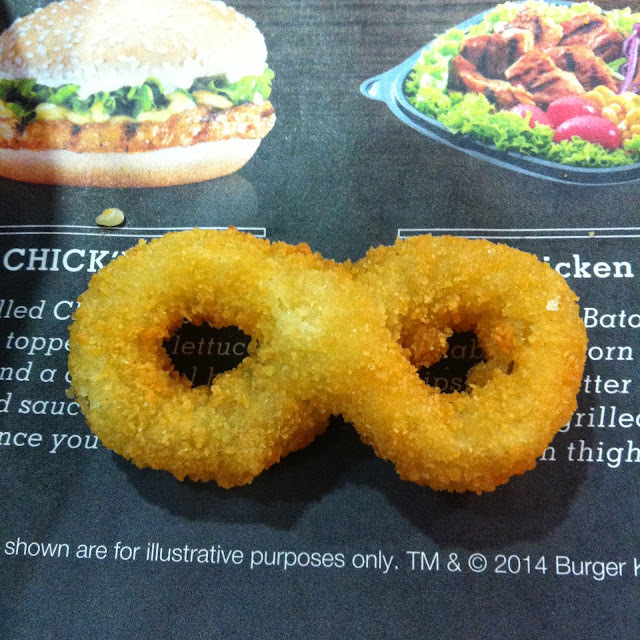 Spotted this "infinity" onion ring! If only there were 2, then it would be double infinity just like in the show "Revenge"!! Decided to go for a walk after visiting my aunt, then Rod and I passed by an alley that made a really cool backdrop for an ootd shot! I swear Le Bf is getting more and more artsy. He took down all of the photos that I stuck up on my bedroom wall and re-pasted all of them up in a super random and artsy manner. Back to the main topic.. After that we just walked around looking for a place to eat. I wanted "exotic" food (well actually not really that exotic but rather something new, exciting and interesting!) because I haven't really stepped out of the house for over 5 weeks since my clinicals started. I really really really needed to spice up my life! Even if by having just an interesting meal..
And that was when we found this place! 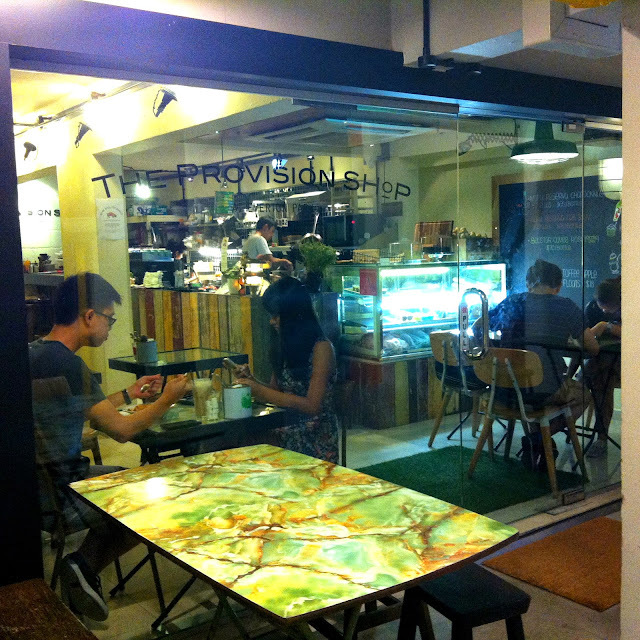 It is a quaint little cafe situated at the void deck of some casual, ordinary, nothing-surprising HDB blocks. We almost walked by it because we were walking at the pavement beside the road and it was hidden from our view because of the estate's garden. What made me stop in my tracks was that uphill pebble pavement that led from the concrete roadside pavement to that unexpected eatery. We did not know what to expect. We walked into the eatery without knowing what sort of cuisine it served or if it was even good... Well, how can we know when we didn't even know about its existence right? It was only after we saw its menu then did we know that we would having italian food for dinner. It isn't our first time having italian food in our little red dot, but the last time we had it.. it was at Mozza (click 'here' to read about it). A fancy pizza restaurant at MBS. And yes, that meal wrecked up quite a bill at the end of it. So onto what we ordered for dinner! I am a huge fan of soups. 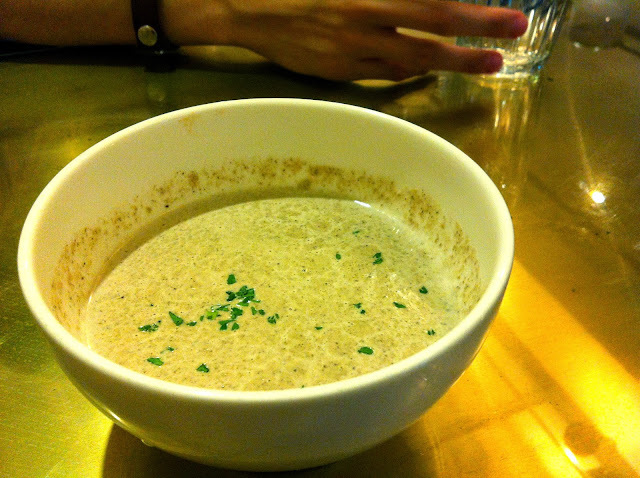 And an even greater one when it comes to MUSHROOM SOUP. I just can't say 'no' to it. Not now, not ever. I still can't decide if I actually like this dish. 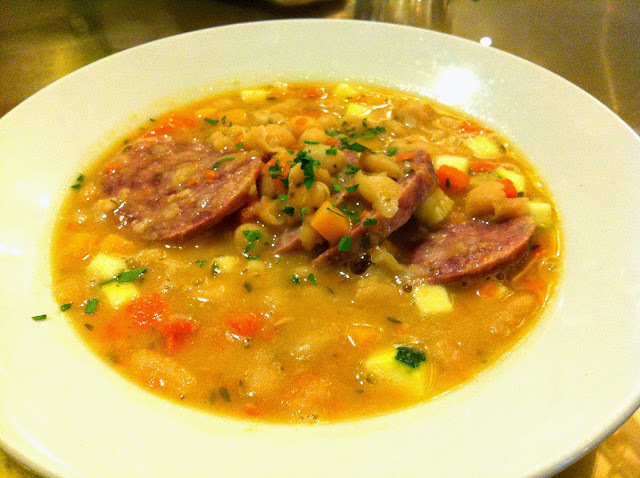 I know that the sausage is the main gist of the dish, but I actually preferred everything else BUT the sausage. I found the sausage to be too fatty and it irked me out after I had my first 3 bites, and later on I felt like vomiting while eating the second piece. So I gave the rest to Rod. As for the portion of food, it is pathetically little for such a price. I was expecting more. 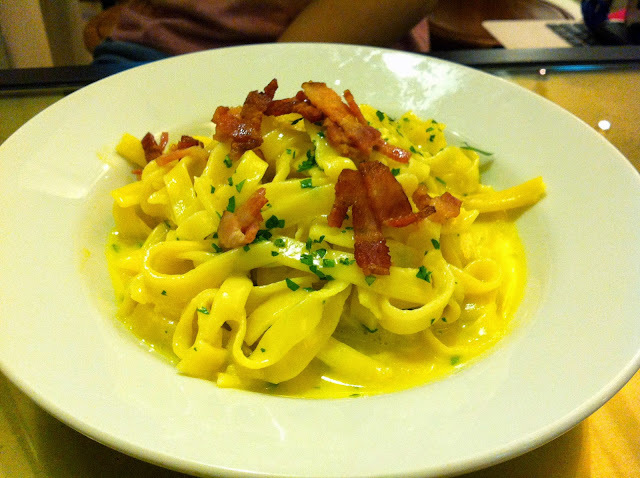 Do not expect to taste your usual carbonara. I can't describe it but they added something to their carbonara which made the taste really different. It isn't a bad sort of different but just different. The good thing about this carbonara is that it isn't as creamy and cheesy like most carbonara, which can sometimes make it hard to swallow or cause one to get sick of the dish quickly. The portion is a bit small though..
Rod ordered Crème brûlée. I didn't have a bite of it because it is a half-cooked egg and I wasn't sure if my weak stomach would be able to handle it. 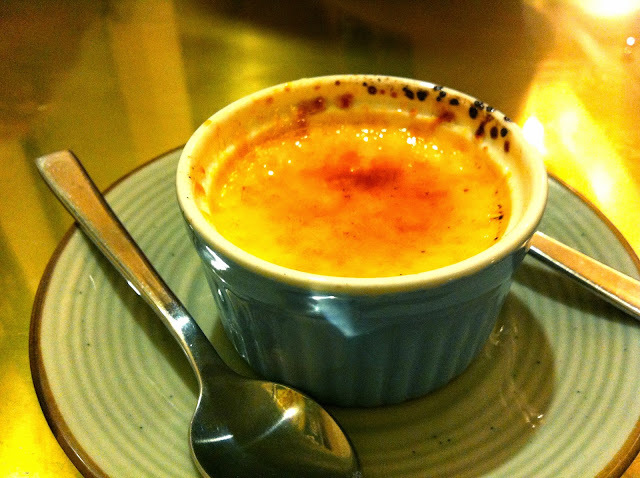 I saw them melt the sugar layer on the top it was served to us and that made the Crème brûlée even tastier! I heard from Rod that most places actually have their Crème brûlée melted beforehand just for convenience's sake, so I guess.. that gives this eatery an extra brownie point? 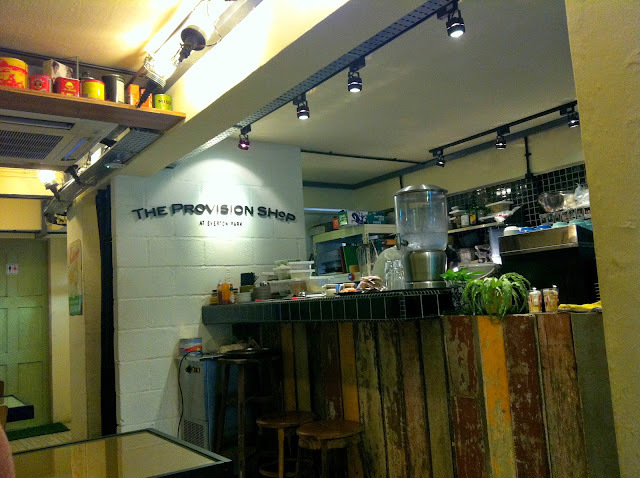 Overall, dinner at The Provision Shop was not too bad in terms of its appearance but the prices were rather steep. Honestly I was expecting much cheaper food given its location and a much larger portion. My favourite out of all the food I ate was actually the entrée, mushroom soup. I guess having brunch there might be better as their brunch menu seems less complex, more visual and appetising. The price looks more reasonable as well! About 10 metres away from The Provision Shop was Grin Affairs. A delightful dessert shop which blew my mind and stole my heart. I love how they decorated the store with their handmade decorations - keeping it simple and sweet. Grin Affairs sold jarcakes with the price ranging around $6. They had so many flavours to choose from and all the cakes are made of fresh and natural ingredients! In order to preserve the quality of the cakes, few are made and so it isn't always that the flavour of choice would be available for purchase! I was lucky enough to try out their banana dark chocolate that day! 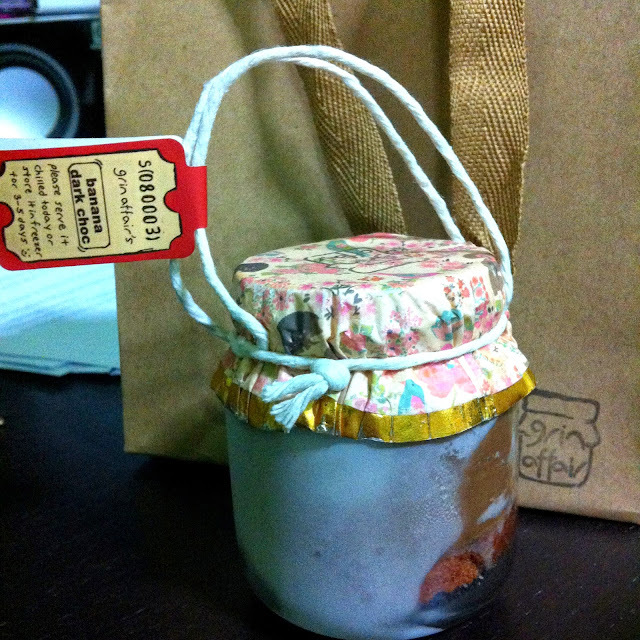 I bought it to-go as they close their shop at 8pm (so be sure to be there before 8pm!!) and it was 20 minutes to closing time. I'm not a fan of cakes. I never was. But this jarcake... I really could not help falling in love with it, and I can't wait till I have some free time on hand to go back and get another one! I had it while it was frozen (but it is recommended to have it chilled!) and the mousse seemed like ice-cream! It was a perfect combination for me.. the cake, the mousse, the banana slices and the cocoa crust. The only thing which I didn't like was the salted caramel, but that's okay because everything else tasted too awesome!! While I was editing my Taiwan trip photos, I realised that I have yet to upload photos for my 3rd day of celebration for my 21st birthday!! So here is the last, but not the least part! 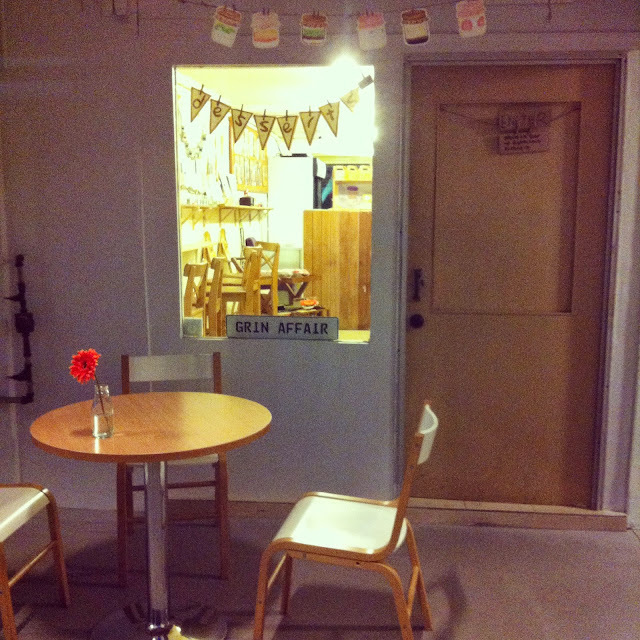 Rod brought me to Cat Café (Neko no Niwa) on the last day of the year (2013)! 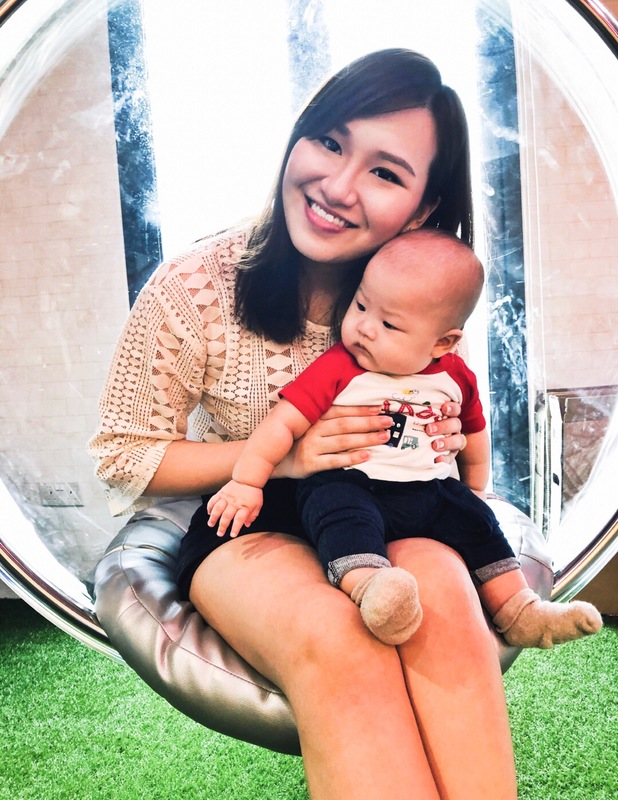 Cat Café is the first of its kind in Singapore. I heard that there is another one coming up soon...? Neko No Niwa means 'Cat Garden' in Japanese. All the cats that you'll see at Neko No Niwa are adopted cats! Ok I am incredibly lazy to write captions from here on. Just gonna keep all the captions damn short and unless necessary. Returning the limelight back to the meow-meows. The place where you interact with the cats is also where you will have your tea or food (if you ordered any). The kitchen and the dining area is separated by a piece of glass. So the staff can see what is going on inside and you can also see what's going on outside too. You'll get your food/drink through a small window in the glass. Ordered a cup of tea while I was there. It's.. okay. Nothing special to it. Sigh.. This pic makes me wanna give it a little rub on his head. So cute. Sad me because none of the kitties wanted to come near me :( So much for being lap cats. They said that the cats would jump on your lap and curl up to take a quick snooze or just to get some pats.. but none jumped on my lap!!! In fact, I think they liked Rod more than me. So anyway... here is me, aiming for a kitty! Ha! I saw you!! I kept houndering this kitty after that.. What?! I gave its fur a nice brush! See!!! I brushed its fur so nicely that it became all shiny and neat! We now have a kitty who is proud of his well-brushed fur! Rat: "Hey there friend! What you doing?" Rat: "Hmm.. No reponse... I'll check back on you again later." Rat: "Hi friend! I'm back!!" Rat: "Gee! You sleep a lot! Let's see if I can wake you up..."
Rat: "Friend! I brought you more friends!! Wake up!!" Rat: "Hellooooo.. Sleepyhead! My friends are already on you!! Wake up!!!" Rat: "This is not going to work is it? Sigh.. I give up." Okay!! Finally done with all the photos taken for my 21st birthday! This is my second long entry in a row. I hope all the cute kitty photos will make up for the lack of interesting blog entries these days. 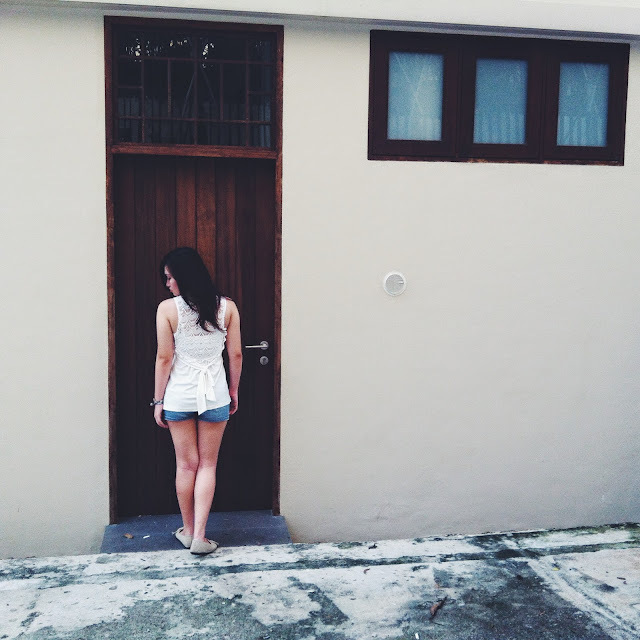 I really miss writing interesting blog posts too.. Boring blog posts = boring life for the moment. Need to hang in there because my attachment will soon be over in another 3 more weeks and I need to cherish every moment while it lasts. Till now, this is the only clinical placement which I know I will miss.